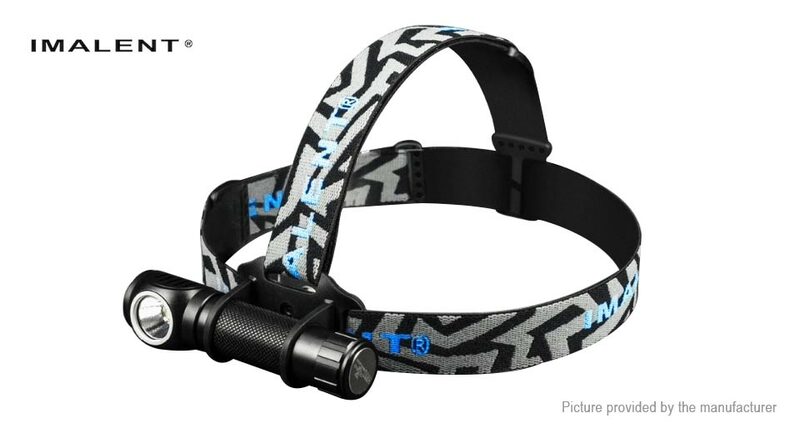 This light is pushing the boundaries of output for a headlamp! 3,000 lumens?!? Crazy. Crazy hot too but what would you expect? 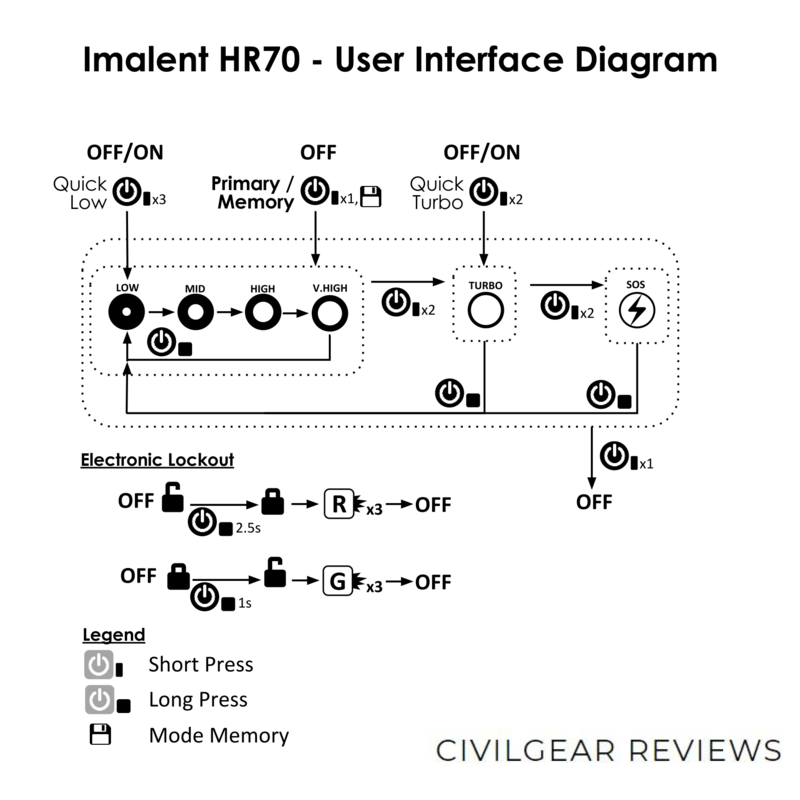 I am very fond of L-shape headlamps and if you are playing that market you’ll want to check the Imalent HR70! 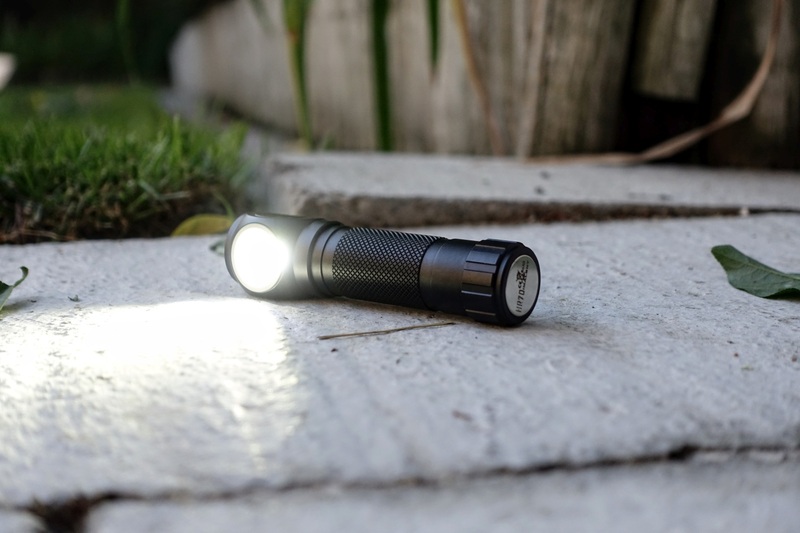 Overall, this light is a powerhouse and a solid performer. To put out so much light from a tiny body, this the light gets and stays pretty hot. Other thoughts, the light could do with a 1 lumen mode and the magnetic charging cable easily misaligns. The outside has the typical diamond knurling but the tail cap is a little different having vertical bars which give this the Imalent look. I really like that there are indicator lights next to the switch which many other L-shape headlamps just don’t have. 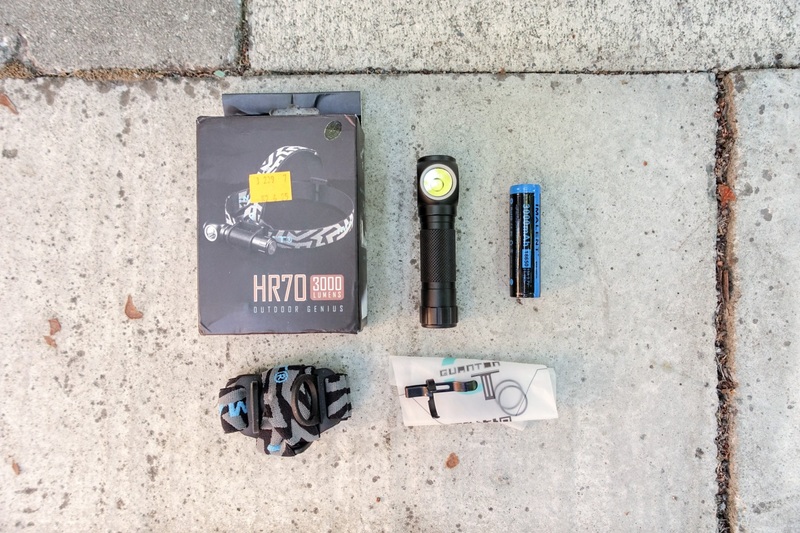 Perhaps the switch could have been made larger similar to the Olight H2R and still have the indicators underneath showing through. There is a magnet in the tail cap which could be made a little stronger. Overall, very rounded and smooth features. The light comes apart in three pieces so be sure to have the head on tight to complete the circuit. I found that the tail cap needs a bit of tight turn at the end to get the final contact. Positive end is in at the head and negative at the tail cap. The anode (positive) contact has a 2 extra bars which serve as the reverse polarity, so you won’t really be able to use flattop cells here. Threads have a fine square cut. The light comes with a pocket clip but does not seem very sturdy and comes off a little too easy, so is room from improvement here. Imalent does not advertise the angle of main LED but from what I’ve collected it seems to be a 100 total degrees spill with a faint 60 total degree spot. Overall, I really like the wide angle and soft transition between spill and spot. The color of this light (left) is still on the cool side but more neutral than I had initially guessed. On the right is the Nichia 219b led in the Nitecore MT06MD penlight. Imalent on left, Olight M2R (“neutral” version, more like warm) on the right. The only feedback is that I would really like a 1 lumen mode. The light comes with a 3000 mAh (which I can verify), 15A, 18650 cell! Reviewing the manual, there is not much discussion of power requirements but luckily the battery they’ve included indicates the 15A requirement specific to high performance 18650’s. If you need to get extras look for “high drain” types. You can run the light in any but TURBO on a regular 18650, but if you have a protected cell, as soon as you double click the light, the over-current protection is likely to kick in and shut down the battery and may need to be resuscitated by a battery charger. There are 2 separate indicator lights (green and red) on the top of the head. When the light is turned on one of the 2 indicator lights will turn on and remain on while the main led is on. If the light is green, the battery voltage is above 3.2V and red if below 3.2V. While charging the red light will glow and turn green when full. The 2 leds is a nice touch for any color blind people but this may not be as helpful in the dark; perhaps a blinking red could have been used instead of having both be a constant on. The built in-charging charges the battery in about 3h 55m. Total capacity is verified as 3000 mAh. The initial turbo lasts for only 2min before dropping down about 32% output (~1000 lumens) for pretty much the remaining time as claimed in the temperature regulation portion of the manual (see next section). A max body temp of 170.0°F and out-the-front temp of 189.5°F was observed for starting in TURBO. When the body temperature reaches 120°F for the first time the light output is reduced from 100% (3000 lumens) to about 30% (1000 lumens) which results in a temporary cool down but the temperature continues to rise to well beyond the 120°F mark. 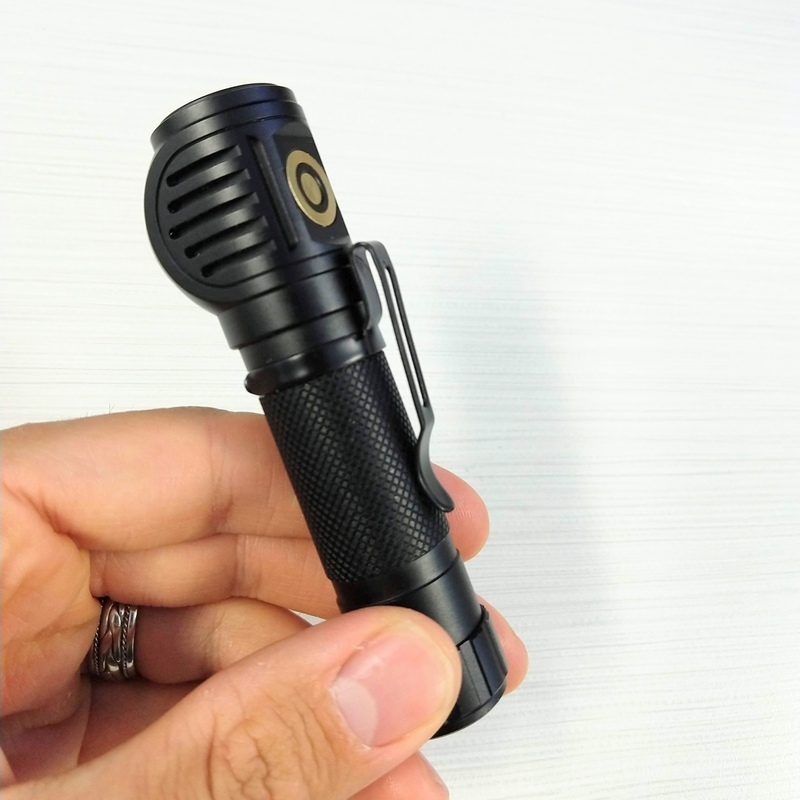 This first half is reflected in the user manual “when the flashlight body internal temperature reaches 50 degrees Celsius [~120 in F], it will automatically reduce the brightness to 1000lm …”. There appears to be no significant PWM on any constant mode, but there is a funny little duty cycle that can be seen as a wavy line. For comparison, the second graph shows PWM varying from 0 to 120 lx on the LOW mode on the Nitecore R25 flashlight. There is no flashling/beacon mode. I measured the light output in relative LUX and I have not spent time yet to calibrated for lumens or factored % of max output. The charts I’ve provided, while are literally quantitative, I suggest using as a qualitative reference for how the output may behave over time; typically lights aren’t left on this long and the max output can be reset. The standard included battery was used for all testing. The light uses a single-stage electronic switch which operates the light. The head also has two little indicator lights, one green and one red. There are 2 different lockout methods, unscrewing the tail cap a little for ‘physical’ lockout, and there is an electronic lockout. The awesome thing is that the 2 different lockout methods are not mutually exclusive, you can use them both together, for added safety. It makes me a little nervous when trying to perform the shortcut to low, fearing I’ll not be fast enough and the light will go into turbo instead.